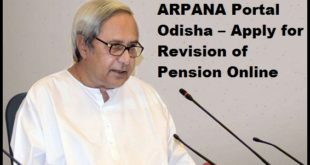 With an aim to ease the process of revision for the pensioners in the state, the Odisha State Government has announced the introduction of advanced web portal ARPANA (Apply for Revision of Pension using Aadhar Number Authentication). The new service has been launched by the state government for ensuring that the services can be accessed by all retiring pensioners within the state. Once the web portal services has been launched fully by the state government, it aims that the pensioners within the state will be able to check with the online status of their pension revisions along with the status of pensions for their family members. Launched by:- The new web portal services was officially launched at pension.odishatreasury.gov.in by the Chief Minister Naveen Patnaik in presence of Chief Secretary Mr. A.P. Panhi and State Finance Minister Mr. Shashibhushan Behera. Launched Date:- The official web portal services was launched after approval from the Cabinet on 21st November 2017. The government has already stated that the new web portal shall be offering with services to the pensioners so they can request for the revision of the pension amount online. Using the portal services the pensioners can also verify with the revision of pension status for any of their family members. The new web portal services will provide with benefit to pensioners who are willing to make use of Aadhar authentication for revising the pension. The government has also kept provisions for pensioner who are not willing to make use of Aadhar authentication for revising the pension as they can also make use of this web portal service. The web portal service can only be used by the retiring pensioners within the state. To get registered and to use the services the applicant has to be the native of Odisha state and should be enrolled under the state government’s pension and retirement plan. The web portal shall provide provision for pensioners who want to use the authentication process by linking their Aadhar cards. Any candidate who is willing to make use of this authentication process will only have to provide with submission of application form and documents online. It will completely help eliminate the need for the applicant to visit the office of the pension disbursing authorities for submitting their pension related documents and application form. If the applicant is not willing to use this authentication then he will have to down load the form and then visit the pension authority office for making the claim for settlements. The application form is available on the government official website on the link provided above. Applicants can directly visit the web portal for completing the process of registration. If you are willing to link your Aadhar then you have to make the selection of the link for online form. Once the form opens up you have to provide with details related to pension type. Applicants have to type their name as on the pension form and Aadhar card. If you are checking with status of your relatives’ pension then you have to provide with your relationship with the pensioner. Applicants are also supposed to provide with valid PPO number for verification. You can make the selection of file from your browser. Next you have to enter the date on which the commencement of pension was made. The basic pension amount in Rupee has to be entered in the relevant field. If you are presently getting pension from any other source then you have to mention it. Next a valid mobile number has to be provided as the OTP generated will be forwarded on that number of verification. Lastly you have to provide with your email id and Aadhar number. Once all details have been submitted you just have to submit the form online. Ensure you verify all information before submitting. If you have to apply for the pension revision with linking your Aadhar card then you just have to follow the same procedure for filing in all your detailed information. Once the detailed information has been filled in you may not have to fill in your Aadhar card detail. You just have to click the submit option. You can take a print out of the application form filed and then submit it manually at the pension disbursing authority office along with all your valid documents. The web portal provides you with the facility where you can track the status of your pension. You just have to visit the web portal and provide with your Application number. The complete form will open up on the page displaying the status of the application. The state government by implementing the new web portal service aims at providing the best governance example to the people. It also aims at improving the security that it offers to the employees and pensioners of the country.